Cars should be fun, so why have so many of today’s sports cars forgotten that and become track day workaholics? Multiple surveys conducted by a wide degree of agencies have concluded that millennials pride experiences over material objects, and this is reflected in the billion-dollar music festival industry as well as the resurgence of spending more money on eating at restaurants rather than groceries. With cars, the experience sector is anything but bleak, with the muscle car wars back in full force and a host of automakers supplying ever increasing amounts of horsepower. Still, something is off and it’s a bit hard to place. Somewhere between when the “Save the Manuals” campaign began and the CVT-laden crossover took over the world, cars were designed with one outlying priority dominating among the rest: providing the customer with a smile and a deep sense of satisfaction. That hasn’t vanished from today’s cars, but the pursuit of lap times and lower grams of CO2 per mile has shifted focus a bit. Thankfully Porsche knew that its customers wanted something more. After all, why put all that engineering talent to waste by taming a superb chassis with overprotective traction control systems or take a manifest destiny approach to an open road and a proper six-speed manual? Coming to the rescue was the 911 R, a car which we assume needs no introduction to you. 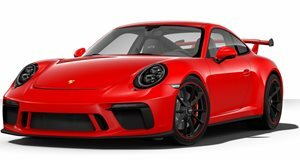 It’s well known that the GT3 RS is an impressive track car, but its capability can mar the fun since it’s more business than pleasure. To cater to fans of the latter group, Porsche reworked the 911 GT3 RS to make this 911 R we see here. How does it stack up? Well, bear in mind that used examples have been selling into the seven figure zone.